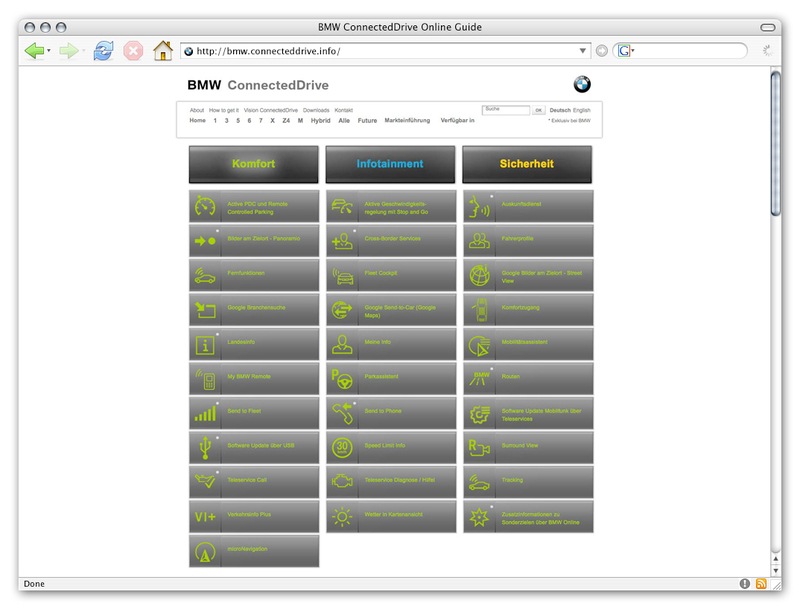 Now Revised: The BMW ConnectedDrive Online Guide. Pioneering Concept: BMW Connecteddrive as a Personal Assistant and Adviser Providing Information When Appropriate, Anticipating When You Might Need Help, and Boosting Sheer Driving Pleasure. Munich.With a range of driver assistance systems and mobility services that is unrivalled worldwide, BMW ConnectedDrive delivers maximum comfort, infotainment and safety in the car. Thanks to the intelligent networking of driver, vehicle and environment, needs-based information is on hand at all times, enhancing driving pleasure even further. 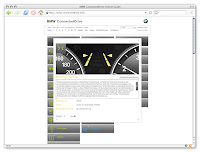 The range of services offered by BMW ConnectedDrive is being steadily expanded. BMW was the world’s first automotive company to introduce many of them into production vehicles, and many of them are exclusive to BMW models. 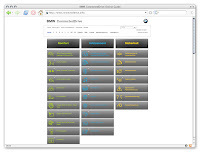 The full range of driver assistance systems and mobility services is presented online in the BMW ConnectedDrive Online Guide . 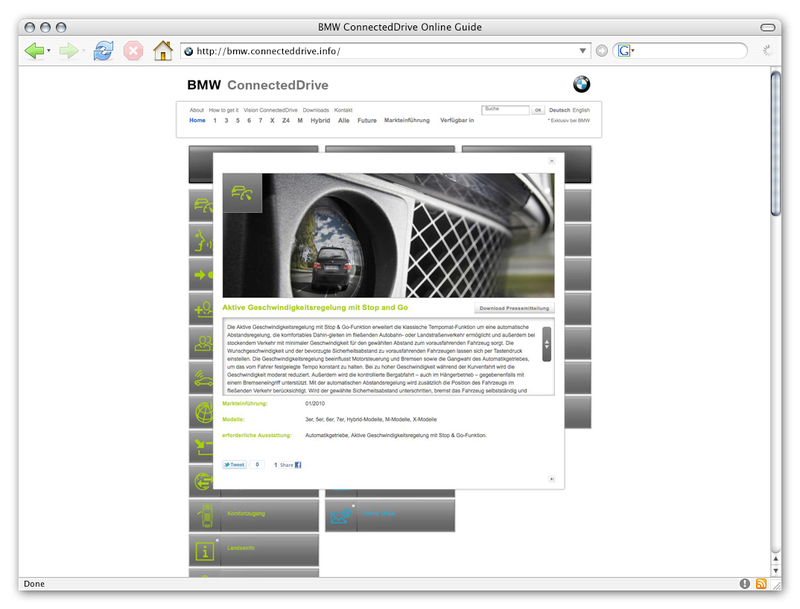 The bmw.connecteddrive.info portal provides an overview of the services currently available, along with thumbnail descriptions and downloads. It also gives information on their availability for various BMW models and when the services were first introduced, as well as the countries covered and the optional equipment required for using the various services. Milestones in the development of BMW ConnectedDrive. BMW’s pioneering work began in 1980. That year saw the world’s first onboard computer with external temperature display introduced in the BMW 745i. In 1992, it was again the BMW 7 Series that was equipped with Europe’s first Park Distance Control system. In 1994, BMW was the first European carmaker to launch an integral navigation system for the BMW 7 Series range, and in 1997 became the world’s first car manufacturer to launch an emergency call system in the USA and then in Europe two years later. In the event of an accident, a telephone link is automatically established with the BMW Call Centre to set in train the prerequisites for a rapid and appropriate rescue operation – a service that is globally unique. Since 2008, Extended Emergency Call with automatic position finding ensures the automatic relaying of additional data to the emergency services, including down-to-the-metre location of the vehicle, its colour, as well as details on the number of occupants and airbags deployed and the severity of the collision. Extended Emergency Call thus plays a pivotal and unique role in saving lives. BMW ConnectedDrive: innovations for comfort, infotainment and safety. 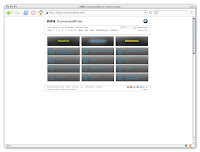 The main attribute of the emergency call function of BMW ConnectedDrive is the personal support offered to the customer by the BMW Call Centre. In a similar way, the BMW ConnectedDrive telephone information service available for all models ensures that the driver receives tailored information which will, for example, help him when travelling to a new destination. This service remains the only one of its kind worldwide to this day. By telephoning the BMW Call Centre, the driver can freely request unlimited addresses or telephone numbers of hotels, restaurants, sports centres, businesses and other facilities, and then have the relevant contact and address details sent directly from the BMW Call Centre into the car. At the press of a button, he can then prompt the navigation system to guide him there or dial the telephone number provided. 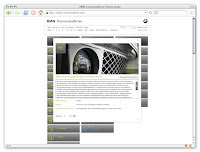 First launched in 2001, the internet-based BMW Online service enables quick and convenient access to information available in the BMW Online portal that has been specifically tailored for in-car use. In 2008, BMW was the world’s first carmaker to allow unlimited internet use in the car. Once again – as with the introduction of BMW Online – BMW took the lead in the field of internet-based services in the car. 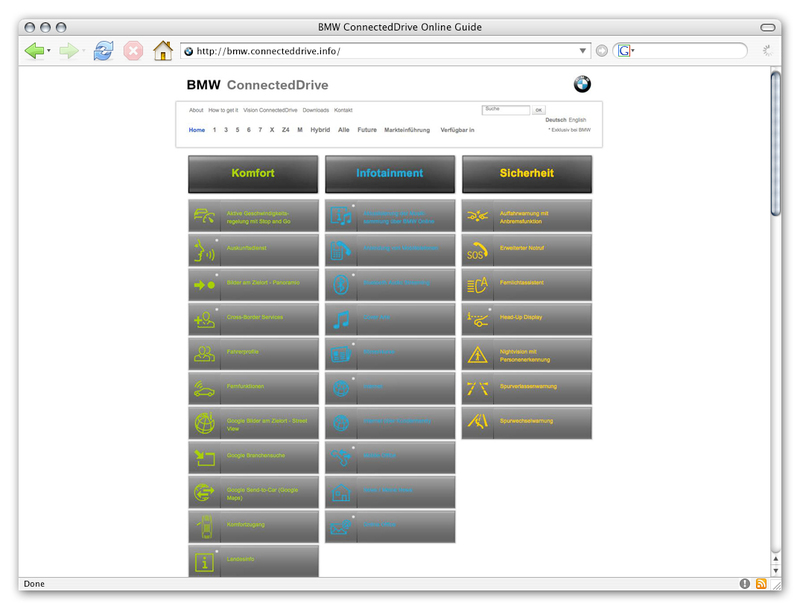 Systematically evolved: the current range of BMW ConnectedDrive services. Today, the range of BMW ConnectedDrive services – the most extensive worldwide – falls into the areas of comfort, infotainment and safety. This structure also includes the growing number of innovative driving assistance systems which contribute above all to optimising safety in various road situations. 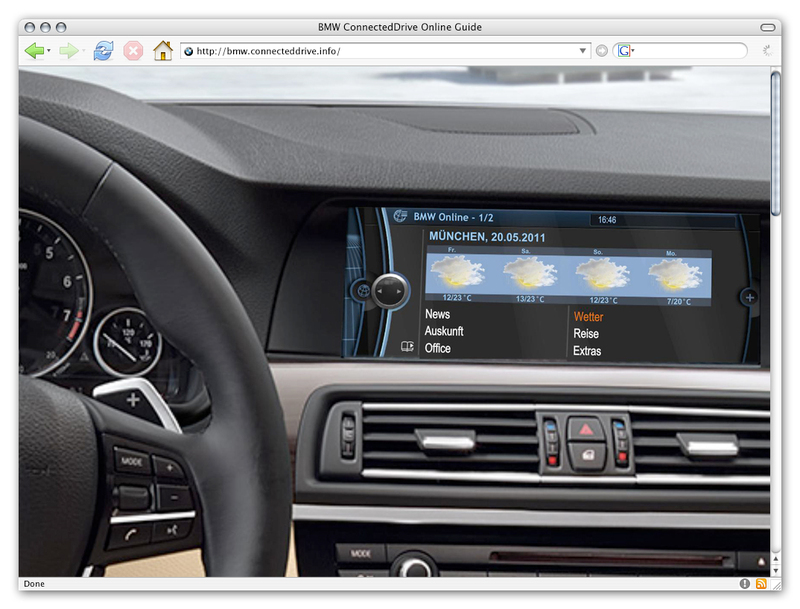 BMW ConnectedDrive services for more comfort. In addition to the personal information service, BMW ConnectedDrive offers further ways of accessing individual information in the car. With the help of the BMW ConnectedDrive function Send-to-Car, addresses and telephone numbers can be found in Google Maps on a PC ahead of a journey and then sent directly to the car at a few clicks of the mouse. Here, too, the address and telephone number can subsequently be accessed in the car and entered into the navigation system and/or telephone at the push of a button. Again with this service, introduced in 2007 and available for all BMW models, BMW is the global leader. An in-car feature exclusive to BMW, Google Local Search allows you to find and use information through the world’s best-known online search engine. To enable this, a connection to Google Maps is created in the car. The car’s location and destination are automatically detected, and the local results retrieved from the Google Maps database are then displayed along with the address, phone number and distance. The results are also shown on a Google Map. The driver can import the search results into the navigation system or telephone by simply pressing a button. Destination Images: Google Street View is a service that gives the driver a visual impression of his destination before he arrives there. Pictures from Google Street View are used as landmarks for guidance. As soon as the navigation system is activated, 360-degree images of the destination are displayed. The driver can also use images from Google’s Panoramio website in a similar way. This features photos of the navigation destination which have been published on the internet by web users and which can likewise be called up and displayed on the onboard monitor. 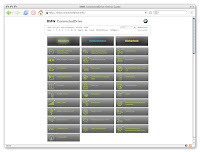 BMW ConnectedDrive Services for more infotainment. 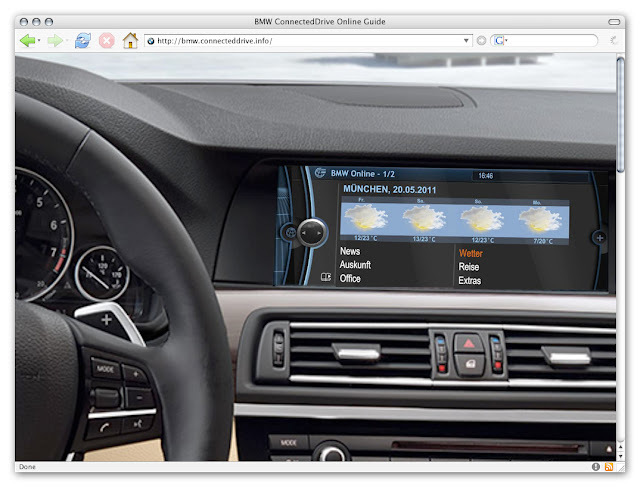 With more new functions, BMW ConnectedDrive is also extending its lead in the integration of mobile devices in the car. Both the range of functions and the selection of compatible mobile phones are unrivalled in the competitive marketplace. It is thanks to close collaboration with leading telecoms providers that BMW is able to offer such wide-ranging and up-to-date options. Since March 2011 BMW will be offering the world’s leading interface technology for integration of the Apple iPod and the latest-generation Apple iPhone in the car. The iPhone can be connected by a snap-in adapter, by cable or via Bluetooth. Thanks to options that are unique worldwide, the telephone and music player functions of the device can then be operated via the controls of the iDrive system. Saved telephone numbers or the music library, for example, are shown on the onboard monitor. Pressing a button dials the desired phone number or calls up a music track. 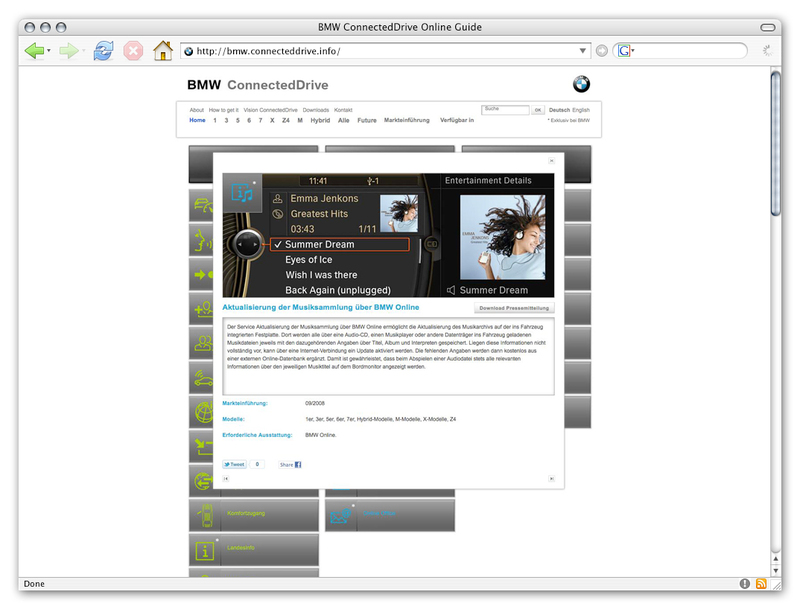 BMW ConnectedDrive: benchmark for the integration of the Apple iPod and iPhone in the car. When it comes to Apple iPod and Apple iPhone integration, BMW has played a leading role for years. In 2004, it was the world’s first car manufacturer to enable the iPod to be integrated in the audio system of its cars. As soon as the Apple iPhone was launched in 2007, BMW was ready to offer an interface in the car that allowed the telephone and music player functions to be controlled via the iDrive system. With the new interface that was introduced in March 2011, BMW is once again setting standards in this area. 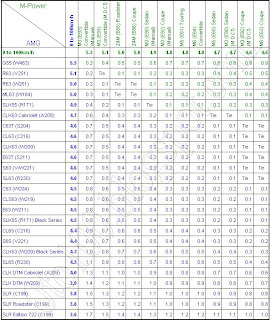 The integration of the iPhone 3G, iPhone 3GS, iPhone 4 and iPod touch (second and third generations), which feature the new iOS 4.2.1 and up operating system, will enable the use of added features. These include the new function PlugIn which, among other things, allows access via iDrive to individual playlists, as well as Genius, a feature that compiles playlists of compatible tracks from the user’s own library. World-first: integration of BlackBerry in BMW vehicles. 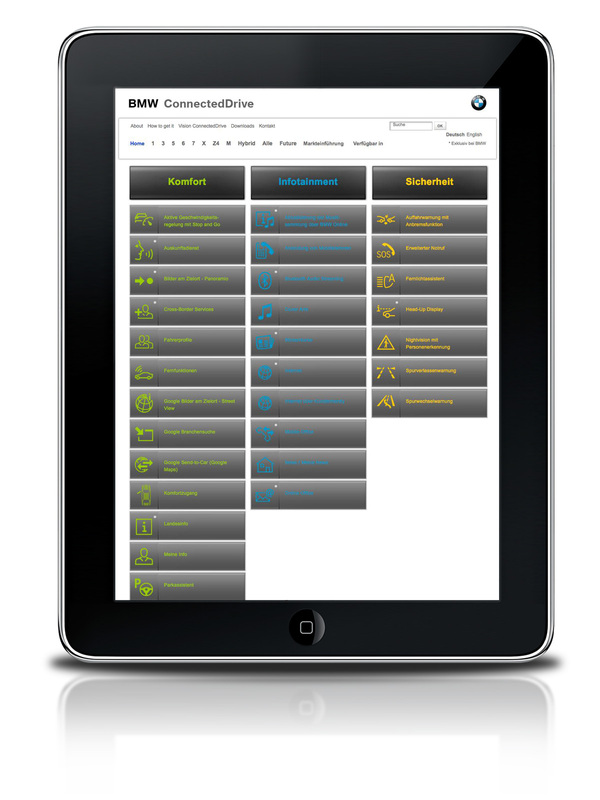 The new Office functions from BMW ConnectedDrive are also unique worldwide. First presented at the 2010 Geneva Motor Show in conjunction with a BlackBerry smartphone, they will in future be available for all BMW models. The new Office functions now also allow calendar entries, written messages (SMS, emails), tasks and memos to be displayed on the onboard monitor and read out using the Text to Speech function. This means the driver can receive news, emails, calendar alerts and memos with minimal distraction from the situation on the road. The telephone function allows contact lists, including image files, to be transferred to the car from a mobile phone or via the Bluetooth interface. When a call comes through, as well as the phone number and name of the caller, their image can also be seen on the onboard monitor. The latest innovations include Bluetooth Audio Streaming, which in future will allow access to personal music libraries not just via a snap-in adapter or cable, but also wirelessly. In addition, the Cover art feature will display on the onboard monitor the album cover for the track being played. A further feature available from autumn 2010 across the entire BMW model range is the world-first Internet via Customer Mobile Phone service. The online connection is established using a compatible mobile phone integrated in the car via Bluetooth. The iDrive Controller is used to access websites, scroll, and activate links. The web pages appear on the onboard monitor. BMW ConnectedDrive Services for enhanced safety and minimum driver distraction. If necessary, the driver assistance systems from BMW ConnectedDrive alert the driver of potential dangers through unambiguous visual, acoustic or haptic signals, such as steering wheel vibration or a flashing light in the exterior mirror or instrument cluster. All other BMW ConnectedDrive services are controlled via the BMW iDrive system. With the launch of its iDrive operating system in 2001, BMW introduced a pathbreaking technology for controlling vehicle functions. The strategic separation of display and control unit has since been adapted in similar form by some other car manufacturers. The extensively optimised 2008 iDrive generation remains a yardstick for simple, safe and convenient operation of in-car functions, allowing intuitive control with minimal distraction from the road. 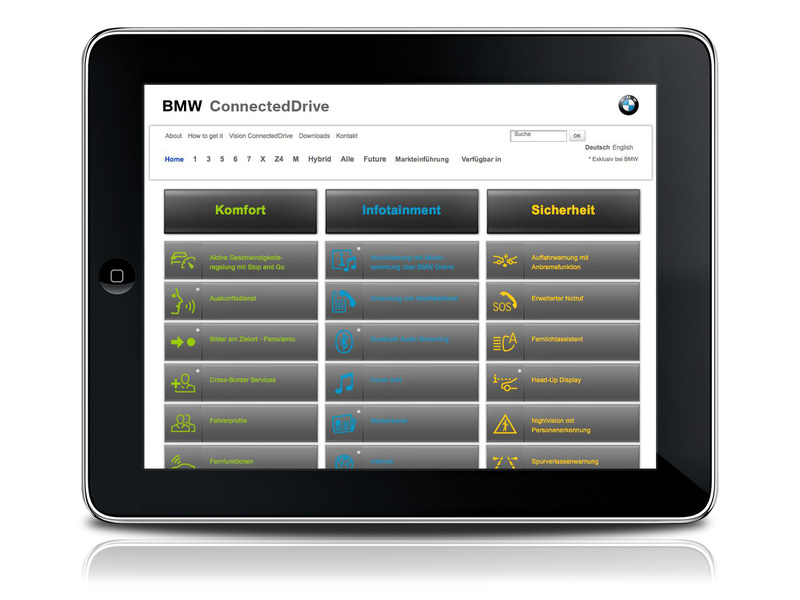 The iDrive operating system thus represents a major safety factor in the use of BMW ConnectedDrive services as well. The driver’s focus on the road is further enhanced by the Head-up-Display from BMW ConnectedDrive. Driver-relevant information in the form of unambiguous symbols is projected directly into the driver’s field of vision on the windscreen. The driver can register information on speed, warning signals and navigation aids, for example, without taking his eyes off the road. BMW’s aim is to enable the driver and front-seat passenger to grasp their individual world of infotainment as intuitively as possible and thus avoid being distracted while the car is on the move. The optimised use of mobile devices in the vehicle plays a crucial role here. Beyond this, BMW ConnectedDrive embraces an extensive range of driver assistance systems that further boost control and safety when driving. The model-specific choice of systems ranges from Adaptive Headlights, available for all BMW models, to the Lane Change Warning System, Lane Departure Warning System and Speed Limit Info, all the way to Active Cruise Control with Stop & Go function including proximity warning with braking function. BMW Night Vision with pedestrian recognition, first introduced in the new BMW 7 Series range, has been setting benchmarks for safe driving in the dark since 2008. Its thermal imaging camera transmits a real-time video image in which people, animals and other heat-emitting objects are show in high resolution on the central Control Display even if they are beyond the range of the headlight beam. Precise analysis of the video data allows the system to register pedestrians and cyclists, in particular, who are potentially in danger of being hit. BMW ConnectedDrive – free of charge for up to three years. 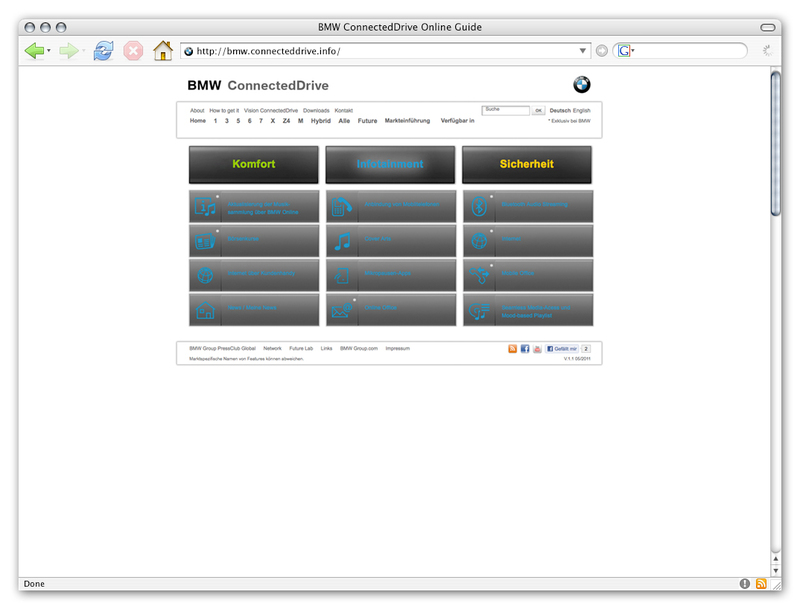 Many of the BMW Online and BMW Assist services from BMW ConnectedDrive, such as the telephone information service, Extended Emergency Call, Google Send-to-Car (Google Maps), BMW TeleServices or the BMW Routes function, are available free to customers in the German market for three years or six months, depending on vehicle specification. They can also be used without charge when travelling in other European countries. After the relevant term has expired, the cross-border flat rate for Germany is 250 euros a year. Internet use in the car independent of this is available at attractive flat rates. The only features not included in this offer are the special-option driver assistance systems such as Parking Assistant, Head-up-Display and Lane Departure Warning System.